Minardi team boss Paul Stoddart says he hopes he will remain in Formula One after agreeing to sell his team to Red Bull for next season. Red Bull take charge of the team from 1 November and will use it to develop their young drivers, but Stoddart said he wanted to still play a part. "I don't think I'm finished in this paddock, I'll miss it too much. I think you'll see a bit more of me," he said. "Whether I stay on as a consultant has yet to be decided, but probably not." Australian Stoddart has been a high-profile figure in the sport since buying the Italian-based team in 2000. 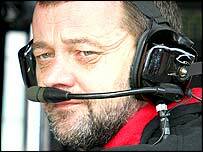 With Eddie Jordan and Peter Sauber having sold up and left the sport, Stoddart was the last privateer team chief, and he said that the way the sport's finances were going, there was no room for their like any more. "Small privateer teams are probably phasing themselves out," he said. "It's hard to imagine a truly privateer team can break into F1 again."